Hundreds of convicted jihadists are scheduled to be released from prison in the next few years, and their numbers will be bolstered by those prisoners who have embraced extremism while behind bars. Prisons can serve as universities of crime for grassroots jihadists who lack terrorist tradecraft, and career criminals who convert will already possess skills useful in attacks. The released extremists will add to the caseload for overburdened government forces working to counter the jihadist threat…. In Iraq, Islamic State leader Abu Bakr al-Baghdadi spent time imprisoned at Camp Bucca. Many excellent books on the rise of the Islamic State, including ISIS: The State of Terror by Jessica Stern and J.M. Berger, have chronicled how that time was instrumental in deepening his radicalism. These books, especially Charles Lister’s The Syrian Jihad, also note the critical role that Syrian President Bashar al Assad played when he decided to release hundreds of jihadists from prison in 2011, helping lead to the group’s explosive growth…. The skills that a criminal develops in planning and executing offenses — criminal tradecraft — are not that different from those needed by a terrorist. And that expertise is often far more useful for terrorist attacks in a hostile environment than the type of basic guerrilla warfare skills most jihadists are taught in training camps. In the past, I’ve noted the the similarities between the criminal and terrorist attack cycles. Jihadists have promoted the leaderless model in their calls for resistance, but this method has one notable flaw: It shortchanges grassroots extremists when it comes to learning terrorist tradecraft. This deficiency often leads to attackers struggling to make successful strikes. Or it can lead to their reaching out for help with bombs or other weapons and ending up being snared in government sting operations. This is where prisons come into play…. Is the War on Terror a fraud? Have you noticed that when the government declares a war on something, it tends to get worse and not better? President Nixon declared war on drugs in the early 70s, yet since then the number of people incarcerated for drug crimes has risen dramatically. And since President G.W. Bush declared war on terror after 9/11, terrorism has grown and spread worldwide. The essay below uses easily verified facts to show many ways in which the War on Terror is a fraud. This brilliant article connects the dots on the War on Terror in a way that our major media have sadly failed us. Even the beginning photo of President Reagan in 1985 meeting with members of the Mujahideen in the White House reveals blatant war profiteering. Explore what is written here and verify the links given to prove that things are not always as they seem. This essay is taken from the incredibly profound online book Lifting the Veil, which uses hundreds of footnotes with links to highly reliable sources which reveal countless political and economic manipulations carried out in secret worldwide by powerful, well-hidden groups for decades. By educating ourselves and shining light into these shadows, we can create powerful change that will transform our lives and world for the better. Thanks for caring. Please spread the word and don’t miss our “What you can do” section…. There’s more than irony involved in how problems are exacerbated when they’re targeted by the state. It’s the same business model as the “war on drugs”. When you access the financing and public trust and legal status to fix a problem, you simultaneously get access to the means to perpetuate and profit from it. Do you really think the cancer industry is looking for a cure, or is it skimming while funneling research dollars into dead ends? Why is obstetrical medicine creating medical crises out of normal deliveries? How did normal male sexual anatomy become a birth defect? Obviously the war on terror could be seen as a vast money laundering operation even without the abundant and obvious evidence that 9/11 itself was a false flag. This is a generic and systemic problem with pervades every aspect of our economy and government. … By my own “guesstimate,” ISIS is the result of a failed US Army behavioral modification program at Camp Bucca, Umm Qasr, Iraq, between 2007 and its closure in 2009. Before pursuing the question of the truth about ISIS, we must ask whether this behavior modification process successful, or did it have an unanticipated opposite result? It seems pretty obvious from our perspective that graduates of the ISIS program went on to become the world’s most notorious terrorist army, a grave threat to world peace? Was this the result of a failed overt detainee/prisoner strategy, or was this the intended result? Was the US Army training terrorists at Bucca, or did its proactive counterinsurgency strategy for detention operations” to turn the prison system into “a legitimate arena for counterinsurgency actions“ backfire miserably, producing a generation of terrorist-jihadis like the world has never seen? Consider what follows to be “hole-filler” in that storyline, hopefully helping readers to link the terrorists back to their state sponsors. 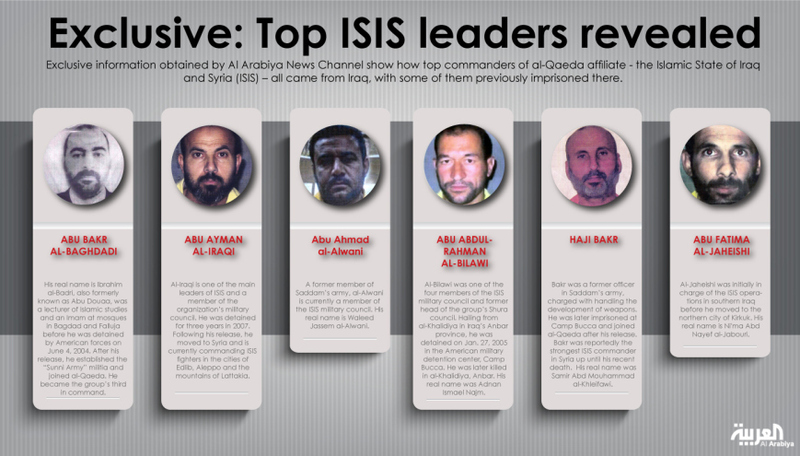 ISIS: Who is former Imam Abu Omar Al Baghdadi and the top ISIS leaders? 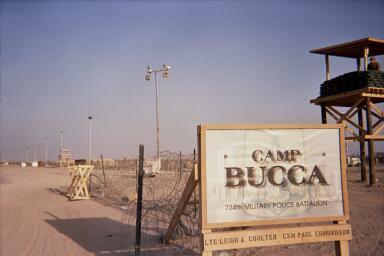 What is significant about Camp Bucca? It was the primary site for an experimental US Army behavioral modification program, Task Force 134, “Detention Operations Process,” which got into detainees home and their lives, as well as reconditioning their heads…. Critics of the facility say it had in effect become a terror training institute, run by resentful inmates under a strict interpretation of Islamic law. Sept. 17, 2009, Camp Bucca Detention Center Closes in Iraq…thousands of inmates are set free in southern Iraq, near the Kuwaiti border. Why is it that no researchers have asked the question “How did AQI suddenly acquire enough money and equipment to turn a failing terrorist entity into an “Islamic Caliphate” overnight?” Even if they did bully the Free Syrian Army and take their weapons,pull-off a “string of bank robberies,” kidnappings and extortion, AQI could never have come up with enough cash to run an army, or to buy a fleet of shiny new Toyota trucks, or to become one of the best-paying employers in the Middle East, without being on some state’s payroll. It is from numberless, diverse acts of courage and belief that human history is shaped. Each time a man, or a woman, or a child stands up for an ideal, or acts to improve the lot of others, or strikes out against injustice, they send out a tiny ripple of hope. And crossing each other, from a million different centers of energy and daring . . . those ripples build a current which can sweep down the mightest walls of oppression and resistance.